You’re Too Stupid To Know What You Want: Buy Now! I’ve often stated on this blog that good marketing requires us to know what our customers want. It is a fundamental principle in marketing and a bedrock truth in persuasion. Aristotle codified this truth over 2500 years ago and smart people have been using it productively ever since. Here’s another bedrock truth: People don’t buy things they don’t want because some aloof, condescending, we-know-better-than-you arts organization told them they should want it. Traditional arts organizations are increasingly marginal, irrelevant and unpopular and, thanks to nonstop media coverage of conspicuous failures, everybody knows it. Arts pros who run these organizations and who think they’re well-positioned to tell people what they should want are either hopelessly out-of-touch or delusional – or both. And when they try to tell people what they should want in communications that are meant to sell tickets, they’re committing an especially tragic and painful – not to mention obnoxious – form of organizational suicide. The only way to sell arts products to new audiences is to know who those audiences are and what they want. Armed with that information we can explain how our art will satisfy their yearnings and, in so doing, motivate them to buy. Marketing is a process of motivating behavior by leveraging desires. If we don’t know what those desires are, we can’t use them to motivate behavior. And, believe it or not, you can’t motivate behavior by trying to leverage desires that people won’t have until after they buy the product. Here’s where arts pros who don’t understand marketing tend to get confused. 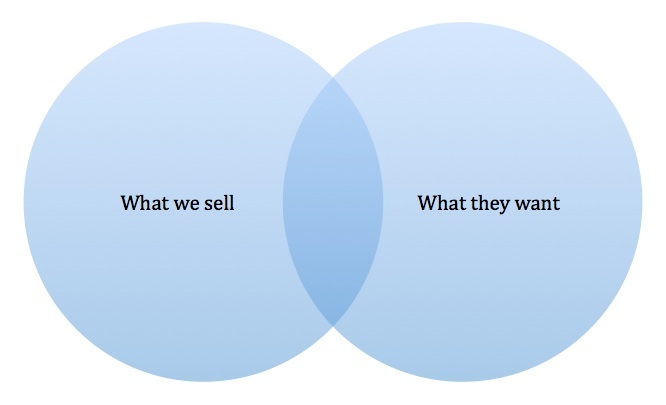 Learning what new audiences want doesn’t mean we have to start selling them crap, it means finding the overlap between what they want and what we sell so we can establish a meaningful connection. It’s not about pandering, it’s about identifying an optimal context for effective communication. It’s about finding a common language based on mutual interests – one that new audiences are most likely to find persuasive. In this diagram, the first circle includes all the ways our products satisfy, and the second circle includes all the things that new audiences say they desire. The place where these two circles overlap contains all the information we need to motivate new audiences to participate by convincing them that our products will satisfy their yearnings. But if we never learn what’s in that second circle, we’ll never discover the place where what we sell and what they want come together. And if we insist on filling the second circle with what we wish were there, or what we believe will appear there if they decide to participate, the information in the overlap will be meaningless and motivationally impotent. Arts professionals who refuse to learn what new audiences want because they prefer to focus on what arts insiders believe they should want – and who make their marketing decisions accordingly – are a danger to their organizations and a detriment to this industry. If we have no respect for the legitimate desires that new audiences already have, independent of their exposure to our art forms, we can’t complain when they ignore the self-important, self-flattering bombast that we insist on publishing in our promotional materials. The day we decide to engage humbly with new audiences and start learning – with sincere curiosity – about their needs, wants and desires is the day traditional arts organizations will stop hemorrhaging customers and start climbing back on the path toward health and sustainability. Only then will we be able to help new arts audiences develop healthy and enduring longings for all the wonderful things they may not have known they wanted. Interesting piece. When one follows this line of argument, people often counter with the example of Apple. Apple are renowned for making products that people don’t know they want yet (or at least that’s how the popular mythology goes). If you changed your “selling” quote above so that it was talking about Apple and not arts organisations, plenty of people would think that’s pretty close to the mark. For some reason it’s not “presumptuous nonsense” when it comes from the late Jobs. Is Apple the exception that proves the rule, or is the mythology incorrect? Hi, Regan, thanks for chiming in. I hear that Apple/Jobs reference often and it is totally off the mark. Steve Jobs’ genius lay in knowing in advance what new products would become wildly popular, not in convincing people that they might come to appreciate, and then one day develop a taste for, old, often obscure, arts products that are already marginal and are becoming less popular with every passing day. To suggest that there is a connection between what Steve Jobs and Apple have done and what the nonprofit arts are trying to do is ludicrous. It’s a perfect example of the kind of delusional thinking I’ve been talking about. The confusion comes from a quote that arts pros have long misunderstood and repeated only in part. I’ve written in detail about this here. I’m glad you brought it up, though, because it’s an excellent cautionary tale for executive arts leaders and conference-going policy wonks who are overly fond of making this comparison.